Whether you are a PC or Mac user, it comes a time when you need to convert various videos files to different output formats. For instance, you may want to burn MKV files to DVD for playing on your DVD player. If you are looking for an all in one MKV to DVD converter, then you do not have to look any longer. Wondershare UniConverter (originally Wondershare Video Converter Ultimate) is the best application to convert MKV files to DVD. It offers an easy way to convert MKV to DVD,and all you need is to ensure that the application is installed on your Mac or PC. In that case, this article outlines the features of the Wondershare UniConverter (originally Wondershare Video Converter Ultimate) and the steps you need to follow for your MKV to DVD conversion. Wondershare UniConverter (originally Wondershare Video Converter Ultimate) is the most compressive video converter among all converters on the Internet. The program allows users to convert a variety of formats to nearly any output format. The conversion speed is incredible, and you can convert as many files as you want at the same time without any limitation. It is the best tool that will support the conversion of MKV to DVD without causing any quality loss. Though the name may depict that this tool is a video converter, it helps in performing other valuable functions. For more information on the functions of this tool, consider the list of features below. Supports 150+ file conversion. It lets you convert the popular and unusual audio and video formats including MKV, AVI, MP4, MPEG-2, MOV, WAV, OGG, MP3, ACC, AC3, M4R, etc. It has a free trial that for your Mac or PC. Convert videos for any devices so as to enjoy on different devices. It converts into formats supported by Android devices, Apple devices, and gaming consoles such as Sony PSP. 30 times faster than any other converter without any quality loss. Download and record online videos from more than 10,000 sites, such as YouTube, Dailymotion, Vimeo, Hulu, and many others with just a click and without any Internet connection. Enhance and personalize your videos via merge, trim, crop, subtitles, watermark, saturation, brightness, contrast, metadata special effects and other functions. All-in-one DVD toolkit that burns video to DVD, backup DVD to a hard drive with zero quality loss. Wondershare UniConverter (originally Wondershare Video Converter Ultimate) supports both Mac and Windows operating systems. The steps for the MKV to DVD conversion in the Mac and the Windows version are almost the same. Therefore, the following video tutorial and detailed steps woubld explain how you can convert MKV to DVD on Mac using the MKV to DVD Video Converter. 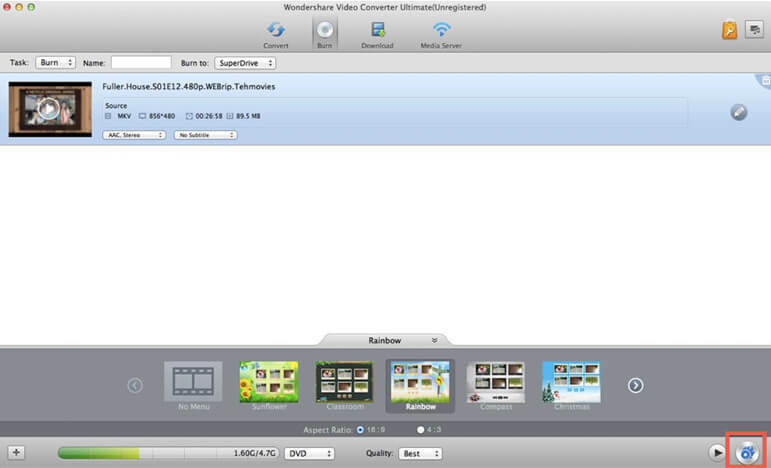 Run Wondershare UniConverter (originally Wondershare Video Converter Ultimate) on your Mac and then choose Burn. From there, you can add the MKV videos that you want to burn through two options. The first choice is to click + button and then browse for targeted MKV files from your computer. The second choice is to drag and drop the MKV videos into the application window. Once you have added all the MKV files, they will be displayed on the window pane in sort of thumbnails. You can add or remove MKV files from the list depending on your recommendations. You can also rearrange the files using ↑ and ↓ buttons. Editing your files is optional and you can skip this step if you do not want to edit or change any setting in your files. However, once you have imported all the MKV files, you can highlight a file by hitting Edit to access the edit window. Here you can utilize add effects, titles, watermarks, crop, rotate, and many other editing features. Next, you need to choose a template for your DVD, which appears below the screen. You can also set the aspect ratio and quality that you prefer. If you are okay with the settings, you can burn your MKV files now. To do so, click Burn and a setting window will pop up. Finally, click Save to begin the MKV to DVD burning for Mac. When the MKV to DVD writing completes, the DVD disc will eject automatically. You can now watch the burned files on TV directly with your DVD player.